The travel journals we bought are just plain notebooks (I prefer my children to create their own content as opposed to the ‘pre filled’ travel journals). 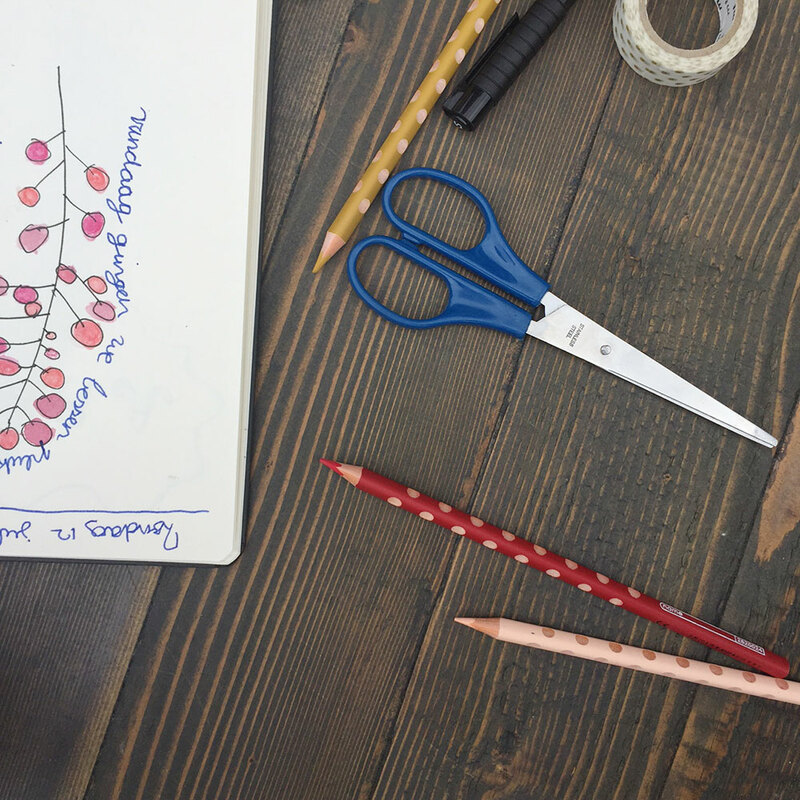 At home, we assembled a pencil case with good quality coloured pencils, a few waterproof black pens , masking tape, a small pair of scissors, glue and a small box of watercolours . This way they can write, draw and paint, they can stick or glue (entrance tickets of museums, sugar bags, clipped mementos, postcards, stamps, pressed flowers, feathers, etc. ), they can make collages, etc. The date today. The location of today. People I was with, or new friends I met today. Where did we stay today? What did we do today? Where did we go? My favourite and least favourite part of the day. What did we eat today? Did I taste or smell anything special? Special plants, people, animals or architecture I saw today. Something I laughed about today, something that made me sad today. Special souvenirs that we found or bought today. A nice book I’m reading, or cool music I’ve listened to. Also, and this is of course a totally redundant gadget but I thought it would be fun to give it a try — I invested in a tiny portable printer. I never really print photos anymore, and I thought it would be so fun to use a photo as a story starter in their journal every now and then. I think I will let them print a special photo every few days (of a beautiful building, special tiles, beach treasures, of fun friends… whatever they think is most special). 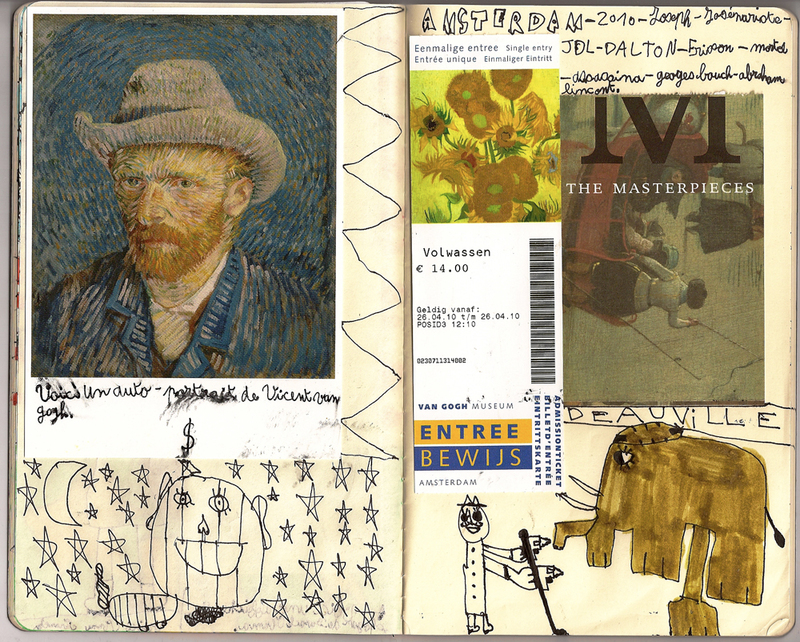 I have shown my children some examples of travel journals on the internet (the image above was found here), showing them how mixing different techniques can give great results. They’re super inspired and are already sitting down a few times every day to work in their books. In fact, I have just bought a travel journal for myself too, as I am now totally inspired myself as well! Such a fantastic idea! As we will travel to and through Norway for a month I was already thinking of a travel journal as it is not only a nice souvenir for themselves but it will also help me creating their travel binder…..that is what my parents created for me and my brother when we were young……It’s been called “Your travels with the parents” and after every trip we made as a family my father created a DIN A 4 double page with a map, photos and short sentences describing “the” moments of our trip together. Something I still treasure a lot (as do my kids ;-))!!!!! Love the idea of the questions, especially for the younger kids! definitely check out dan eldon’s travel journals if you haven’t already! they are so inspiring, and i think they start when he was 7 years old – also, it is fun to glue envelopes onto a few random pages before you set out, to inspire a little treasure chest amongst all the words and pictures – have a blast on your trip! This is great! I also love the inclusion of the questions and map to follow along. My daughter’s school sent home a similar “writing and reading” journal for the summer which is a blank journal including 1 or 2 colored sheets of paper inserted as well as an accordion sheet of paper that she can unfold to create on and 2 pages with a few blank squares to write or draw a small sequence. We will definitely have to try a travel journal for our next trip. Thanks for this post. Oh, this is so exciting to get a mention in your great blog. Thank you, Esther! My kids are too small for travel journals, but I will certainly give them the opportunity later in life. I wrote journals as a child and to read them now is so special, even though a lot of entries make me laugh at myself. Certain things have not changed at all though. love this idea…..thanks for sharing it…. beautiful inspiring ideas, tips, and the images from Valérie, amazing and lovely. While we can’t travel this summer, I still want my son to keep a journal over the summer and this gives me lots of ideas to inspire him. It makes sense to show him some examples of how it might be done so that he doesn’t get set in a rut. Thanks! Oh the questions are such a great ‘starter’, thank you for the idea. We’re off to Scotland this summer, maybe I’ll scribe for Toddler and get one going? Was just thinking that recipes you pick up while traveling would be a nice thing to add in. My girls are in Italy with their grandparents at the moment and have been learning how to make some excellent pasta sauces.. I love this! I still have my travel journals from when I was a child through young adulthood, and there are many drawings and paintings alongside my writings, which inspire my artwork and design today. It’s an amazing way to view travel experiences from the past.